This is an Avon "Wishful Thoughts"" from 1982. 5 1/2" high porcelain figurine. Wishing will make it so...childhood memories exquisitely captured in lovely porcelain. 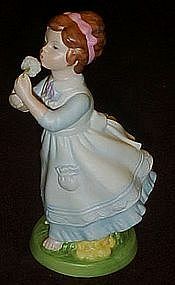 This winsome figurine, reflecting the quiet moments of childhood,of a girl blowing on a dandelion. It has been meticulously crafted and painstaking handpainted by gifted artisans. Wishful Thoughts in limited edition, a beautiful beginning or a valuable addition to your collection of lovely porcelain. Exclusively from Avon. No box.